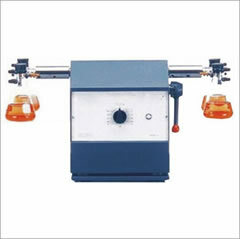 SGM introduced world's best Wrist Action Shaking Machine, which is used for general-purpose and it's found very useful for mixing or agitation ingredients, solution in flasks, designed to hold flacks from 100 ml to 1000 ml council or round bottom. Variable speed controlled by regulator fitted with Fractional HP Motor. The power Supply is 220 volts AC -50 Hz. It has a heavy cast iron base with rugged construction and two side arms for holding flasks. It is fitted with a F.H.P. Heavy duty motor with variable speed. It can hold Flasks from 100 to 1000 ml. The capacity is supplied with cord and plug to work on 220/230 volts A.C. supply. It is general purpose machine and found very useful for mixing or agitation ingredients, solution in flasks, bottles, beakers and Kahn rocks etc. 1. To hold 4 flasks. 2. To hold 4 flasks and top platform to hold 4 flasks. 3. To hold 8 flasks. 4. To hold 8 flasks and top platform to hold 4 flasks.